When you upgrade your internet connection with IdeaTek services, it is important that you have the BEST overall internet connection you have EVER experienced! When using either our Gigabit or Lite connections, you will experience a very quick and very reliable internet connection from IdeaTek. While our fiber connection will give you the best performance you have ever received, here is information on why your devices may be reporting speeds different then the speeds to which you are subscribed. Explore this article to find out why. Laser light signal delivers the internet over glass Fiber, bringing you the fastest, most reliable connection that currently exists. This Fiber terminates at your location, in an IdeaTek placed CPE 'modem' that converts the laser light signal to digital electrical signal. You will always experience the best speeds when using a wired (ethernet CAT5, CAT5e or CAT6 type cable) connection between the IdeaTek CPE equipment and your router as opposed to a wireless configuration. That said, your personal router may or may not be designed or capable of outputting the highest speeds that they receive from the CPE. Ensure that your router connects with 10/100/1000Mbps speeds by checking with the manufacturer's website. NOTE: The maximum internet speeds (as reported on a speed test) are always dictated by the devices through which the signal passes that you are using to test the speed (and the location/connection of the speed testing website). IdeaTek recommends that you use speed test www.speedtest.net when testing your home or business network. We recommend you test both your wireless and wired connection to best understand the functionality of your internet network (router and devices). If uncertain of your device's maximum speed, please check the manufacturer's website for details for that given model. *Note: Your wireless speed will be limited by the device with the slowest wireless speed capability. In some cases this is the router, access point, or the wireless card in your wireless device. For more information see Device Speeds. Connect your wireless device (Laptop Computer Recommended) to your personal wireless network's radio channel (2.4Ghz or 5Ghz). Record your download speed and your upload speed. *Note: Your hardwired speed can be limited by your computer's network speed maximum capability. Many laptops only transmit and receive up to 100Mbps. Find the Ethernet cable delivering internet service to your router. Take that Ethernet cable and plug it into your laptop or desktop computer. This will remove your router from the equation. Below are top speeds you can expect to see on some commonly used devices. 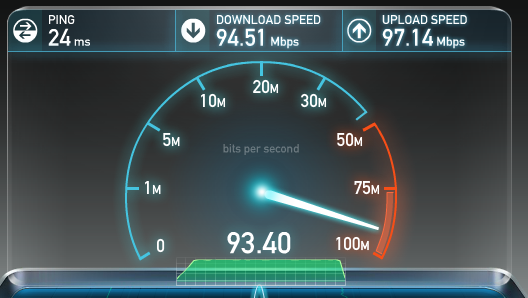 These speeds are based on the manufacturer's designed speed capability of the device. *Check manufacture's websites for the most up to date information on any devices not listed or newer.